Route by Jessica Auer, first women ever to get all controls in under 2 hours. 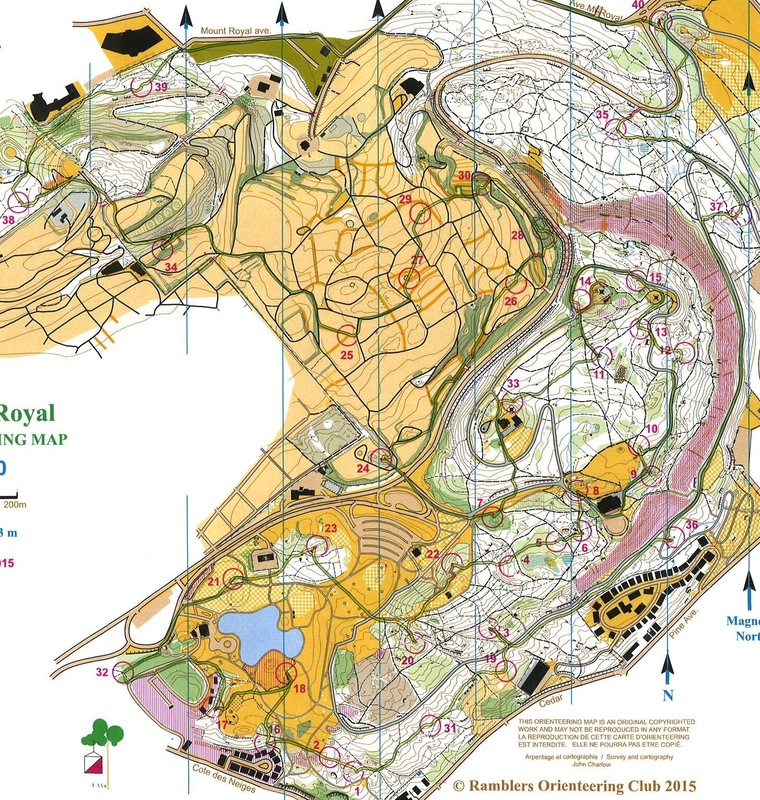 This event, with its mass start and 2-hour-maximum format, is an annual favourite amongst Orienteers. 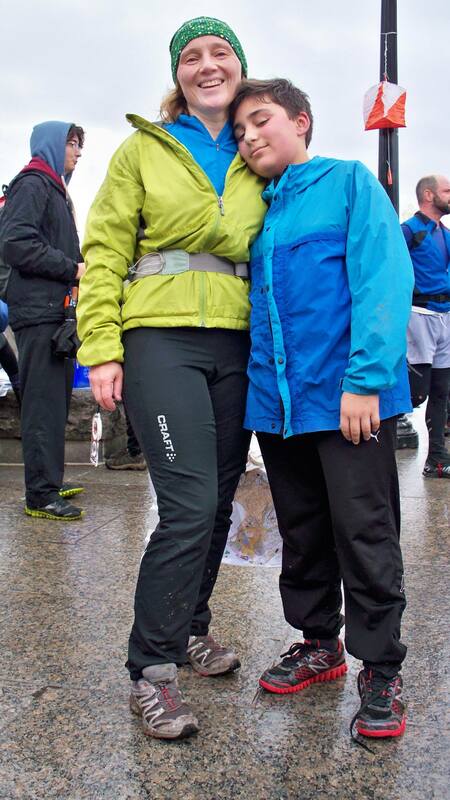 On Sunday, in spite of the light rain that fell during part of the race, 180 enthusiasts took part. It’s too bad that only a few organizers get to see the often thrilling finishes. This year we witnessed one of the best. With nearly 45 minutes of the 2 hours left to go, Francis ran in to the finish but almost immediately darted off again. 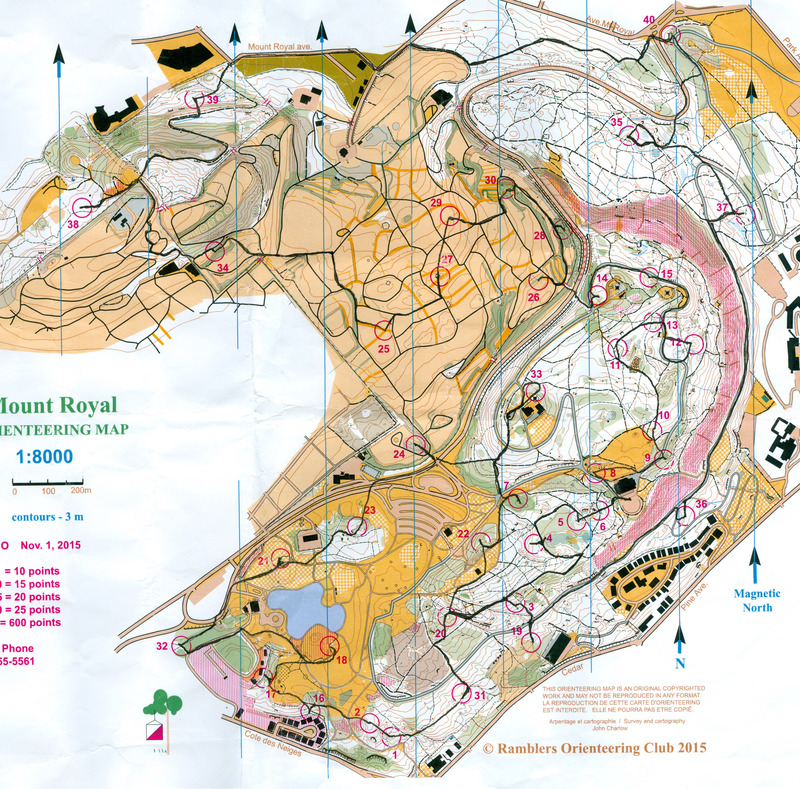 He had forgotten #32 at the extreme west edge of the map – 2.75 km (roundtrip) later and he was back, but now in 4th place. In the meantime, another thrilling chase had occurred. Thomas Kneubühler and Tapio Haarla came sprinting hard to the Finish but, oh no, Thomas had also over-looked a control and he too darted off to get it. Tapio had won his second Score-O with us! The first was in 2008. A Very Big THANK YOU to the many, many members who helped at the event; foremost among them: Bruce, who designed the course and, with Elaine, put in place all of the controls. Many diligent hands are needed to handle map preparations, registrations, organizing waivers, checking and tallying result cards, as well as picking up the controls after the event. Full results are here. Tapio Haarlaa from Finland is discussing his route with local Thomas Kneubühler. 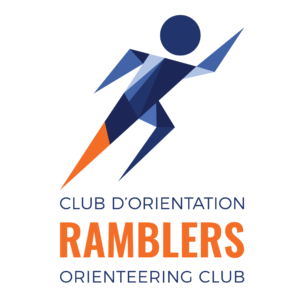 Ramblers member Dmitri Golovanov attended this summer the WMOC 2015 in Gothenburg, Sweden, and later the Maritime Orienteering Festival in New Brunswick. Watch his videos from two sprint events, shot with a headcam, including live gps. We took our first steps towards instituting an electronic timing system. 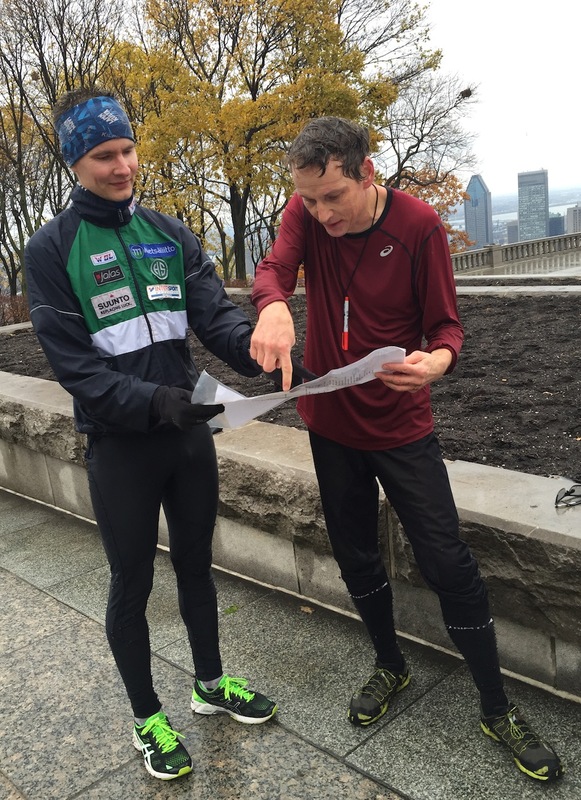 Actually, it’s getting pretty rare in 2015 to find an orienteering club, even in North America, that does not use such a system. But they don’t come cheap and they do require a knowledgeable group of persons interested and capable of running it. We are fortunate to have the essential beginnings of such a team in Bruce and Dmitri. We decided to start with 50 “petals” (the electronic card/dibber that you carry on your finger) and four “stations” – sufficient to do the start and finish timing (only) of competitors on the two advanced courses. Plus two laptop computers. Happily, at their first use, everything worked as expected. As for the cost, the decision was not to go with the rather expensive, though most commonly used ‘SI’ system, but instead to purchase a trial number of pieces of the new SFR system. It has recently been sanctioned by the International O Federation for use at certain major meets in Europe. We can even make the “dibber” parts ourselves, saving even more. Sunday, May 24th, will be the second time the partial system will be used. If you would like to help, we hope we will see you there.